Series# UL1429-22-XXSS-0250. PVC Insulated UL1429 MIL-W-16878 22 AWG (7/30) hook-up wire on a 250' spool; Striped Wire. Add a stripe to the 10 standard colors available! Series# UL1429-24-XXSS-0500. PVC Insulated UL1429 MIL-W-16878 24 AWG (7/32) hook-up wire on a 500' spool; Striped Wire. Add a stripe to the 10 standard colors available! Series# UL1429-22-XXSS-0500. PVC Insulated UL1429 MIL-W-16878 22 AWG (7/30) hook-up wire on a 500' spool; Striped Wire. Add a stripe to the 10 standard colors available! Series# UL1429-20-XXSS-0500. PVC Insulated UL1429 MIL-W-16878 20 AWG (7/28) hook-up wire on a 500' spool; Striped Wire. Add a stripe to the 10 standard colors available! Series# UL1429-18-XXSS-0500. PVC Insulated UL1429 MIL-W-16878 18 AWG (7/26) hook-up wire on a 500' spool; Striped Wire. Add a stripe to the 10 standard colors available! Series# UL1429-24-XXSS-1000. PVC Insulated UL1429 MIL-W-16878 24 AWG (7/32) hook-up wire on a 1000' spool; Striped Wire. Add a stripe to the 10 standard colors available! Series# UL1429-22-XXSS-1000. PVC Insulated UL1429 MIL-W-16878 22 AWG (7/30) hook-up wire on a 1000' spool; Striped Wire. Add a stripe to the 10 standard colors available! Series# UL1429-20-XXSS-1000. PVC Insulated UL1429 MIL-W-16878 20 AWG (7/28) hook-up wire on a 1000' spool; Striped Wire. Add a stripe to the 10 standard colors available! Series# UL1429-18-XXSS-1000. 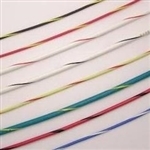 PVC Insulated UL1429 MIL-W-16878 18 AWG (7/26) hook-up wire on a 1000' spool; Striped Wire. Add a stripe to the 10 standard colors available!